An extract from Brian J. Krummel’s new pinhole book The Pinhole Camera – A Practical How-To Book for Making Pinhole Cameras and Images. 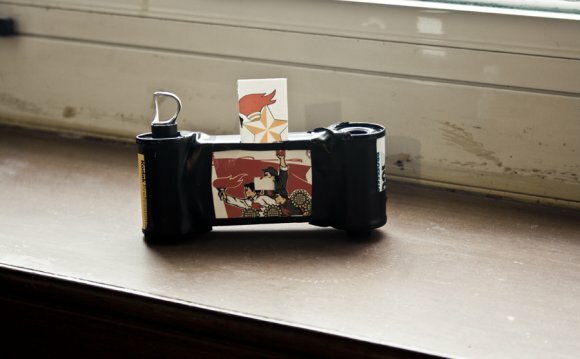 Construct a simple 35 mm film pinhole camera from a small matchbox, a roll of film, and an empty film canister. The matchbox camera produces an interesting wide angle image due to the extremely short focal length while the convenience of 35 mm film makes this small camera fun and practical to use. All of the supplies for this workshop are common household items. The only items that you may need to acquire are the empty film canister and the D-ring. Separate the matchbox cover and tray. Locate the center of your cover and cut a small 1/4" hole in middle with your blade. Next, construct a simple pinhole. Mount your pinhole plate, over the cut out section on the cover of your matchbox. You can use black tape to hold the pinhole plate in position. After your pinhole is in place, wrap the matchbox cover in black tape. This will prevent light from penetrating the thin cardboard. Lastly, create a black tape shutter and place it over the pinhole. Set the cover aside and work on the tray. It is better to understand the purpose of the matchbox tray before proceeding. The film will be held in position as it passes between your tray and the cover. A portion of the matchbox tray is removed, creating a mask for the 35 mm film. Only the portion of film that passes behind the mask will be exposed in your camera. Plan your mask and use the cutting blade to create an opening in the tray that will serve as the image mask. The ragged edges created by your blade will add interest to your images. If you want a more finished mask, line all openings with some tape to create clean, straight edges. When your mask is finished, cover the interior areas with black marker to reduce reflected light. The ragged edges of the image are created by the matchbox mask. If you have an uneven edge to your mask, any imperfections will be recorded on the film. This can be used as a creative approach to your image-making. To load your camera, find a fresh roll of film and one empty canister. Empty 35 mm spools are available at one-hour labs. Take your fresh roll of film and pull out a small section of leader film, approximately 2" in length, from the canister. Cut the curved leader off, leaving a nice straight edge to your film. Feed your film through the left side of the matchbox cover. Pull the film through until it comes out on the opposite side of your matchbox. Cut a piece of black tape approximately 2" in length. Locate your take-up canister and align it on the right side of your matchbox camera. The receiving spool should be pointed downwards on this side; when it meets the trimmed fresh film, splice the two pieces of film together with the black tape and ensure that they are secure to one another. Wedge your matchbox tray inside the camera. It should be firm and snug within the camera, but not impossible to move. The film stock should run underneath the mask. Insert your D-ring into the bottom of the take up spool. Gently turn the D-ring clockwise to pull the film through the matchbox.